Which Rice to Use for Risotto? Home > Rice & Pollenta > Which Rice to Use for Risotto? Science matters a great deal in the creation of a risotto because of the effect the cooking process has on the individual grains of Japonica rice, the family to which all three main varieties sold in Italy belong, and the different properties of them. Take Arborio, for example. A large plump grain designated 'superfino' because of these dimensions, Arborio is very popular in northern regions such as Lombardy, Piedmonte and Emilia Romagna. Inside those generously proportioned grains is a relatively large amount of a starch called amylo pectin. Why Arborio Rice for Risotto? When the Arborio grain begins to cook in a broth, the heat has the effect of drawing out a large amount of the amylo pectin. This, in turn, gives the finished risotto a rich, dense consistency while the individual grains, slightly al dente, are easy on the teeth. So why do these northern regions favour Arborio? Simply because the qualities it brings to the dish compliment the other ingredients that they favour. These include what might be termed more robust elements such as meat and cheese, or earthy additions such as mushrooms or olives. But what if a more delicate composition is desired, such as asparagus and lemon, or some wet fish or seafood? In this case, the heavier Arborio should be substituted for the stubbier semifino Vialone Nano variety. This grain incorporates a large amount of another starch called amylose, which causes it to retain a greater degree of integrity at the end of the cooking process. 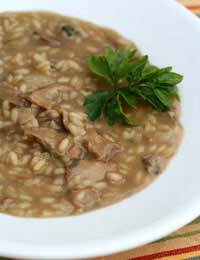 The resulting risotto would, therefore, be more liquid, or soupy, than one produced using Arborio, and a little more al dente. Such a consistency is favoured in the Veneto, where an abundance of seafood heavily influences the menu, and is referred to as risotto all'onda, literally to the wave. The Carnaroli grain was created to provide the characteristics of both Arborio and Vialone Nano and, therefore, it is its versatility rather than distinctive performance in the pan that marks it out as a popular base for risotto. It is also a little more expensive than the other two, although it should be remembered that it does not pay to invest too much in the ingredients and too little on the rice.